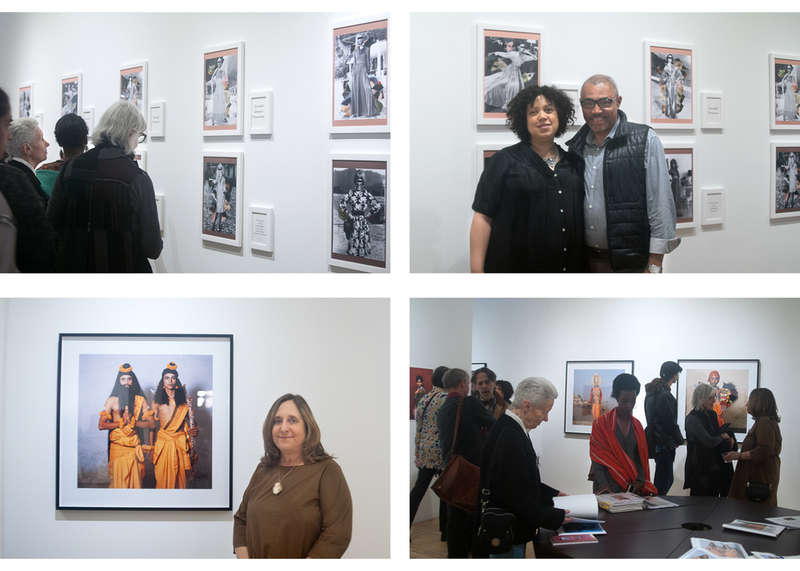 sepiaEYE gallery was pleased to announce Dress-Up, a group exhibition in which costume, performance, persona, and pose are explored through the lens of photographers Qiana Mestrich, Phyllis Galembo, and Charan Singh. Qiana Mestrich’s series Namesake and Inherited Patterns cleverly expands on the artist’s exploration of her namesake, Qiana®: a silk-like nylon fabric made by the DuPont Experimental Company in 1968. The fabric became fashionable in the 1970s as a popular choice for disco attire and in turn, through heavy marketing, the name was adopted for many young African American girls born in the years to follow. Mestrich visited the archives of DuPont in Wilmington, Delaware, selecting vintage fashion marketing materials featuring Qiana®. The resulting images from Inherited Patterns (2014) combine these vintage photographs with fragments of mug shot photos of other women named Qiana. It was for an earlier series, Namesake (2013) that Mestrich began to look at these mug shots of predominantly Black and Latino women who share her rst name, Qiana. Inspired by Allan Sekula’s essay “The Body and the Archive,” Mestrich questions the instrumental use of the camera to identify and control “the criminal body” with the mug shot being its most effective method. Namesake was created by re-photographing the web-resolution mug shots sourced online. The “photographs of photographs” result in nebulous images with brutal but beautiful colors that metaphorically reference violence. The women’s faces become abstracted and reduced to just their skin color and become a ghostlike presence, drawing attention to issues of racial pro ling and violation of privacy. 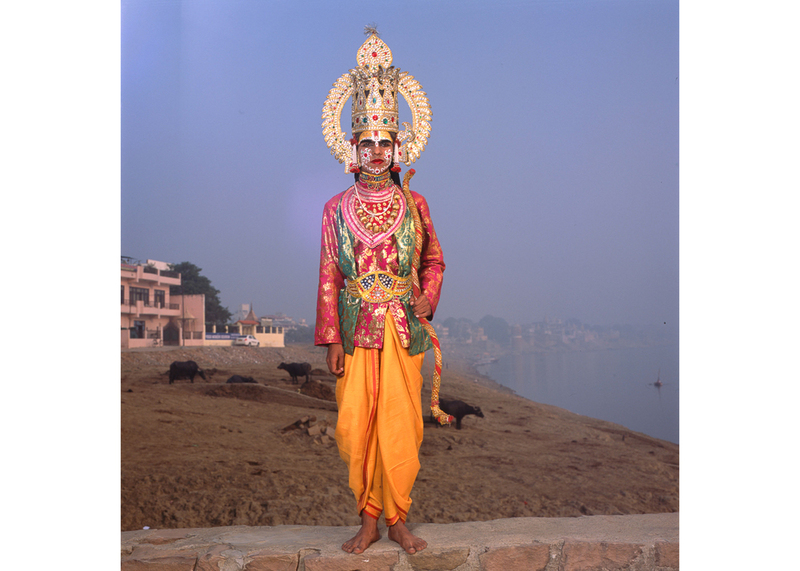 Phyllis Galembo’s recent series records the actors of the Ramlila in Ramnagar and throughout Varanasi, India. The Ramlila, or “Rama’s play,” is a dramatic re-enactment of the life of Rama, which ends in ten-day battle between Rama and Ravana as described in the Hindu religious epic, the Ramayana. The enactment of the story in Ramnagar attracts thousands of visitors to Varanasi, and, with the use of big sets, costumes, and amateur actors from the area—some of who are the latest generation to play those roles—the whole city is transformed into a big open-air stage. As a chronicler of the transformative use of costume in parades, religious and holiday rituals for over thirty years, Galembo was naturally drawn to document the Ramlila in her inimitable style. With the aid of intricate costumes, whimsically painted papier- mâché masks, and ornate make up, her subjects fully inhabit their roles as the gods and goddesses of the Ramlila. “Using direct, unaffected portrait style, Galembo captures her subjects informally posed but often strikingly attired in elaborate colored robes, spectacularly decorative fabrics, and spooky masks and makeup. Galembo’s subjects level a penetrating gaze at a photographic interpreter who has managed to collapse, for a moment, the cultural, racial and economic distance between herself and them.” —Calvin Reid, Art in America, December 2005. Charan Singh, born in India and based in London, introduces us to a world of Kothis, Hijras, Giriyas and Others. Kothis (effeminate, underprivileged, homosexual men), Hijras (eunuchs), and Giriyas (partners of kothis and hijras) are indigenous terms used by queer working class and transgendered men, in their own dialect, to de ne their particular sexual identities. While India’s photographic history is disproportionately rich with documentation of the most privileged classes and castes, the subjects on which Singh chose to focus his lens were never a part of this formal visual history of India. Outside of their representation as victims of the HIV and AIDS crises, Singh’s subjects had never been given the opportunity to express themselves as they chose to be portrayed. The bold, con dent personas and poses they adopt and the clothing they choose to represent themselves are usually inspired by Bollywood, the most readily available cinema and television to members of the Indian lower-class. Qiana Mestrich lives and works in Brooklyn, NY. 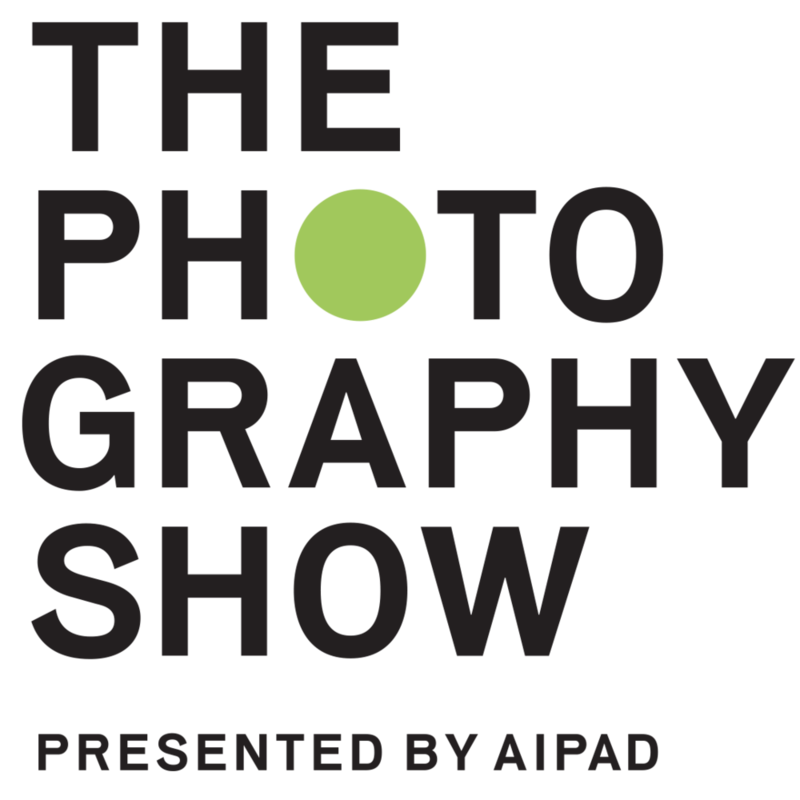 She is a 2013 graduate of the ICP-Bard College MFA in Advanced Photographic Practice and received her B.A. from Sarah Lawrence College with a concentration on photography. Mestrich is the founder of the Dodge & Burn blog, co-editor of How We Do Both: Art and Motherhood (Secretary Press, 2012), and has published numerous books including Some Kind of War (2013), Invisible - Part I and Part II (2012), and Hard To Place (2015). She has had solo exhibitions at the New York Public Library, New York (2014-2015), The Project Space at Corridor Gallery/RUSH Arts, Brooklyn (2014) as well as group exhibitions including “On Being Black", Arnika Dawkins Gallery, Atlanta, GA (2015). Phyllis Galembo lives and works in New York. She has been a professor in the Fine Arts Department of SUNY Albany since 1978. Her photographs have been exhibited by museums including the American Museum of Natural History, New York (1998), George Eastman House, Rochester, New York (2008), the Smithsonian National Museum of Natural History, Washington, D.C. (2001) and the Tokyo Metropolitan Museum of Photography (1999). Awards include a Senior Fulbright Research Award and a Hasselblad Masters Award as well as an Artist’s Fellowship from the New York Foundation for the Arts. Her work is included in the collections of the Houston Museum of Art, Houston, TX; the Shomburg Center for Research in Black Culture, New York, NY; The New York Public Library, The Metropolitan Museum of Art, New York, NY; The Polaroid Corporation, Boston, MA; The Rockefeller Foundation, New York, NY, and numerous others. Publications include Maske (Chris Boot, 2010/ Aperture, 2016),Vodou: Visions and Voice of Haiti, (10 Speed Press, 1998/2005), and Divine Inspiration from Benin to Bahia (University of New Mexico Press, 1993). Charan Singh lives and works from New Delhi and London. He is currently a PhD candidate in Photography at the Royal College of Art, London. His work has been exhibited at Vadehra Art Gallery, New Delhi (2014), The Photographers Gallery, London (2015), GFEST: Gaywise Festival, London (2015) and FotoFest, Houston (2015).